Apple’s innovation strategy involves terrific new products and innovative business models. Genius ergonomics make Apple products effortless to use. “Design is not just what it looks like and feels like. Design is how it works,” said Steve Jobs. Apple has repeatedly demonstrated with its innovation management what a success user friendliness and design can generate. How can Apple ‘get’ design when so many other companies try and fail? 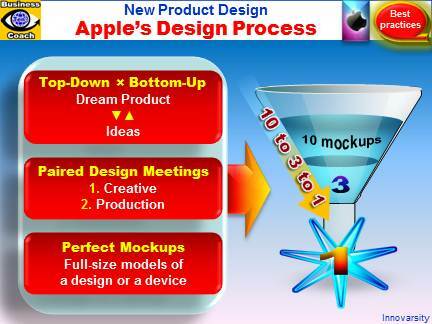 Here are some key elements of the Apple’s design process. Senior managers describe their dream products and outline what they want from any new application. In response, design teams select and present the best ideas from the paired design meetings to leadership, who might just decide that some of those ideas are, in fact, their longed-for new products. In this way, the dream products morph into deliverables. Top managers are also involved in the development process to ensure that there are no nasty mistakes down the line. Every week, design teams at Apple have two meetings: a right-brain creative meeting and a left-brain production one. At the creative meeting, people are to brainstorm, to forget about constraints, to think freely, and to go crazy. At the production meeting, the designers and engineers are required to nail everything down, to work out how this crazy idea might actually work. This process and organization continues throughout the development of any application. The balance shifts as the application progresses. Options are kept for creative thought even at a late stage. Creating a full-size model of a design or a device requires a huge amount of work and takes an enormous amount of time, but it removes all ambiguity. That might add time up front, but it removes the need to correct mistakes later on. “I’m as proud of what we don’t do as I am of what we do,” used to say Steve Jobs. Apple’s strategy for innovation demands that design ideas to be generated in multitudes. They are all run through a sort of artificial natural-selection mechanism that kills off the weak and only lets the strongest ideas rise to the top. Apple designers give themselves room to design without restriction and come up with 10 entirely different mockups of any new feature. Later they whittle that number to three, spend more months on those three and then finally end up with one strong decision.